OK, it’s official now: after a working life of about 15 years I will finally have my indefinite contract at Wageningen University. So while teaching (a lot), publishing (less than I should/want to), attracting research funding (more than I dared dream of), and presenting and writing my research vision to the advisory committee, I must have done enough right to convince the committee that the university should keep me. The committee will reconvene in about a year, however, to decide whether I’m good enough to be appointed associate professor. So yes, I’m happy that I can continue with what I am doing, and that I can further develop my line of research here. I like Wageningen University, although I admit that the only other universities I have ever worked at were Tilburg University, where I did a post-doc from 2006 to 2008, and UC Santa Barbara, where I have spent a sabbatical in 2010. The environmental economics tradition in Tilburg is much more theoretical and monodisciplinary than the one in Wageningen. Admittedly, they publish more in the top journals like JEEM, ERE, or REE than we do, and I think we should have the same ambition. On the other hand, the tradition in Wageningen is more problem-oriented, more involved in developing countries, and more interdisciplinary. I feel the Wageningen approach suits me better. How do I feel about the whole tenure track system? A lot of people complained before, during, and after its introduction. And yes, I’m one of them, but I’m convinced it’s better than my university’s old system. The elementary particle of Wageningen University’s institutional structure is the chair group, which comprises a scientific discipline or subdiscipline such as aquatic ecology, environmental systems analysis, or environmental and resource economics. The head of a chair group is the chair holder, and in the old days the chair holder was mostly the professor of the chair group. There were some personal professors, but mostly these positions were created by the management, after which a suitable person was recruited. In other words, staff smart and ambitious enough to become a professor had to wait for the chair holder to leave, and hence mostly left before the chair holder did. I’m sure there was a way of getting rid of truly disastrous professors, but mediocre professors could remain unchallenged for their entire career because the smarter staff went elsewhere. The old system was a recipe for stagnation and intellectual laziness. At least tenure track offers the staff that would have left under the old system a path towards professorship inside Wageningen University. This raises the question how many professors a university can pay, and this question has been asked repeatedly. I don’t know how the university expects to pay for all these people, but my experience in Tilburg, which at the time employed about three professors in environmental and resource economics (besides a host of others in microeconomics, experimental economics, and what not), is that tenure track can develop the organisation into a healthy market for ideas. As far as I could see the professors in Tilburg seemed colleagues rather than rivals, although I guess there must have been some form of competition for funding and the brightest students. They exchanged ideas, read and commented on each other’s papers, and wrote papers together. (The Dutch language has a great word for this: conculega, a portmanteau of the Dutch words for competitor and colleague.) I think that is a much healthier situation than the little monarchies we have had so far in Wageningen. The day we arrived in Hanoi, Tu invited us at his home to get a taste of genuine Vietnamese biodiversity: swimming crab, carp, blood cockles, tiger shrimp, squid and some other species I don’t remember. Like many Asians, the Vietnamese like their seafood fresh: everything except the carp and the squid was alive (and moved). It was served around a big bowl of broth, with tomato, ginger, pineapple, and lemongrass, where everything was cooked and the broth slowly became a delicious fish soup: say hello to the Vietnamese hotpot. As far as I could see, all of the seafood served came from aquaculture – not a big surprise in a country that ranks third in global aquaculture production. Tu works at the Vietnamese Research Institute for Aquaculture as a fisheries economist, and he does his PhD research at our group on how the shrimp farmers in the Mekong delta adapt to climate change. Expectations are that as sea levels rise, and average temperatures increase, shrimp farmers will increasingly have to deal with disease outbreaks and salt water intrusion (black tiger shrimp are a bit like Goldilocks, preferring their water not fresh, not salty, but brackish). How will these farmers deal with these problems? In other words, what kind of autonomous adaptation will they implement, and what kind of planned adaptation can or should the government implement? I had discussed these issues at length with Tu over the last twelve months or so, but it is difficult to discuss these issues if you have never seen these farms in reality. So Monique and I reserved a few days to travel to Soc Trang, Bac Lieu, and perhaps Ca Mau, where most of the Mekong Delta’s shrimp come from. We were joined by Tu, Le Xuan Sinh (an aquaculture expert from Can Tho University) and Nguyen Trang (a master student at Wageningen University who does her thesis work in the Mekong Delta). Sinh suggested to drive along the coast road between Soc Trang town and Bac Lieu town the first day, and stay the night in Ca Mau town. The day after we went deep south: by car to Nam Can (the most southern town of Vietnam that can be reached by car), and then the boat all the way to Mui Ca Mau (the southern cape of mainland Vietnam). No matter how much I had read about Vietnamese shrimp farming before I came, it still struck me how different the shrimp farms in different regions are, and how strongly these differences depend on their natural environment. 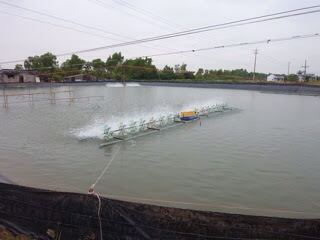 The relatively fresh waters of Soc Trang allow for intensive shrimp farming, in many cases even with systems where the pond is perfectly separated from the water or canal. These are fairly capital-intensive systems, with neatly dug ponds, aeration devices, and much use of shrimp feed and other inputs. These farmers have the system quite under control. How different are the farms you find deeper south, in the vast mangrove forests of Ca Mau province. The water is much more brackish here, so that the ponds are more strongly connected to the rivers and canals. Farmers let water in or out to control the salinity of the water, and in some cases to take in shrimp seed and fish. 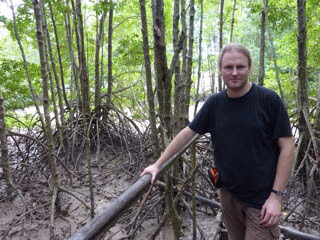 In the center of the pond you find planted mangrove trees that provide food and shelter to the shrimp, and that are usually sold after about 15 years for firewood or charcoal. 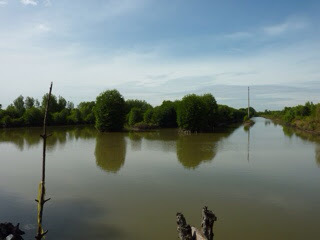 The farmers use little feed because the shrimp can feed on algae growing on the mangrove trees. Apparently our visit was quite an event for this farmer. 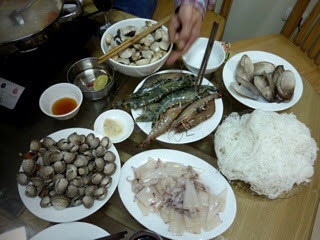 He invited us for a meal of cooked crab and some sort of Vietnamese jenever. Even though it was 11am we bravely jugged the stuff down because it would have been impolite to refuse. 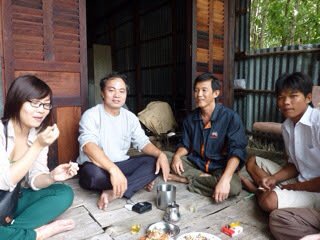 So here you have another problem of doing field work in Vietnam: you need to be able to drink. Heavily. All the more reason to let the respondents come to some central place instead of going from door to door yourself. Although it is hardly featured in tourist guidebooks, I consider Ca Mau one of the highlights of my trip to Vietnam. Of course for being invited to food and drink with some shrimp farmer, and for the thrilling boat trip through the mangrove forests to Mui Ca Mau, but also for the mangrove forests themselves. I just love mangrove forests. The sheer fact of having a forest in such a salty, tidal area, with stilt-roots sticking in the mud. And when you look closely, at any square meter of the mud between the trees, you see the forest is teeming with life. Different species of crabs crawl over the bottom. A snake slithers by. Mud skippers skid over the puddles of brown water at the edge of the forest. So what have I learned from this trip? First of all, there is no one-size-fits-all solution for Vietnamese shrimp farms to deal with medium-term or long-term changes in their natural environment. Adopting a closed system, or cultivating white leg shrimp (a hardy species from South America) instead of black tiger shrimp, may work for the intensive farmers in Soc Trang but not for the extensive farmers in Ca Mau. Second, there is a looming problem in almost all shrimp farms: the waste coming from the pond. Farmers regularly clean the ponds, and then a muddy mixture of shrimp faeces and salt comes out. It may have been a good fertilizer if it weren’t for its salinity. So far no solution has been found for it yet, so all farms have a load of salty mud piling up. The farmers are not allowed to dump the mud in the river, but monitoring and enforcement is weak and the farmers have little alternative. Third, another problem is that the stock of wild shrimp is declining as more and more farmers catch wild shrimp seed in order to cultivate it in their ponds. Wild shrimp tend to be more disease resistant, but there is of course only so much that the local ecosystem can provide. Fourth, conducting a survey in areas like Ca Mau is going to be a daunting task: getting there over water, identifying and randomly selecting respondents, and last but not least staying sober. I’m having a crazy week of teaching this week. I’m teaching two lectures on fisheries economics tomorrow; an R practical in fisheries economic modelling and a lecture on dynamic programming on Wednesday; and a practical in dynamic programming in R and a lecture on ecosystems complexity on Thursday. Meanwhile I’ll be hosting a guest lecture on Wednesday (a speaker from Shell on energy policy) and on Friday (a speaker from Statistics Netherlands on environmental statistics). Next week I’m teaching two lectures on green national accounting, one on fisheries economics (different course), one on cost-benefit analysis, and hosting another two guest lectures. It’s like this every year, but I enjoy it as much as it is exhausting. February is a very short teaching term at my university (don’t get me started on the merits, or lack thereof, of our academic calendar), where students are supposed to study one course, full time, in three to four weeks. I contribute to two courses in this term: one MSc course about natural resource economics and one at BSc level where we present six current topics in environmental economic policy from the viewpoint of academics and that of the real world. In the first course I get to tell students all about the topics I deal with most of my research time (fisheries economics, dynamic optimisation, ecosystem management); in the second course I can invite speakers to discuss the nitty-gritty of environmental policy-making with students. What’s not to like? By the way, in addition to the R practical I revised my introductory text on dynamic programming after seeing how it worked at last year’s practical (not at all). As always, comments are welcome. The Mekong delta is just about the flattest region in Vietnam. In some places, where extensive green rice fields stretched between lines of trees that marked the otherwise perfectly straight horizon, we almost felt like we were back in Holland. A place as flat like this must be as exposed to floods as The Netherlands. And it is. Even fresh-water areas here have a strong tidal variation. Usually the people take advantage of the steady rising and falling of the water level, irrigating their rice fields and catching small shrimp to grow further in ponds and baskets. Water is central to life in the Mekong delta: until the government improved road infrastructure, most transport took place by boat. The floating markets around Can Tho are popular tourist destinations. But the water is a treacherous friend. In 2000 the Mekong raised about 5 meters high, submerging hundreds of thousands of houses, and drowning hundreds of people as well as cattle and crop. The area saw another big flood in 2011. Expectations are that the flooding problem will get worse as the global climate gets warmer, bringing heavier rains and a higher sea level. But even a climate change skeptic should be able to see the importance of learning to deal with these heavy floods. Much of what the inhabitants can do makes sense even if no climate change occurs: strengthening dykes, building higher or stronger houses, buying insurance to cover the financial risks of crop and cattle loss. One of the big questions is what the government can or should do (planned adaptation in jargon), and what the local residents do (autonomous adaptation). Binh is the smartly dressed gentleman in the center. The ponytailed Dutch guy in the ugly red shirt, that would be me. 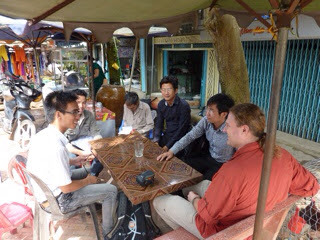 One of our PhD students, Phung Thanh Binh, does his research on flood insurance in the Mekong delta, under the supervision of my colleague Zhu Xueqin and myself. Are local residents interested in getting flood insurance, and if so, under what conditions? What insurance premium are they willing to pay for a little bit more coverage? If they have flood insurance, will they still prepare for floods or will they transfer some of the risk to their insurance company? 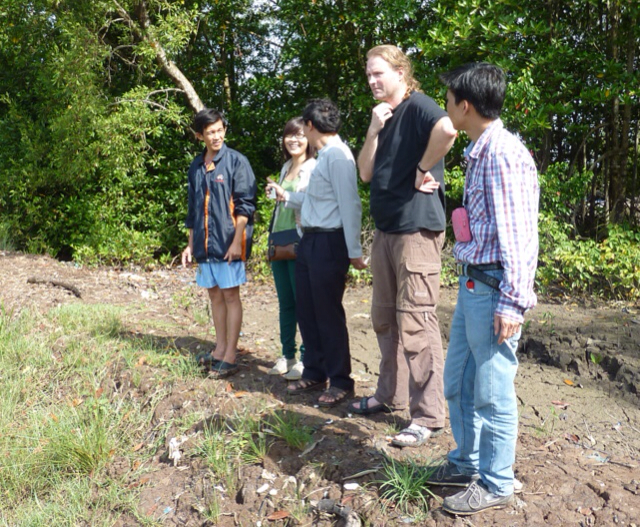 It was good to visit Binh’s research site, and to see how he conducts his survey. I had not realised how complicated such surveys can be around here: just going from door to door, as you would do in countries like Kenya and Tanzania, is unlikely to work for several social and cultural reasons. 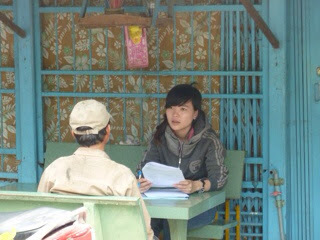 Binh invited, through local authorities, respondents to come to the local community office where one of Binh’s research assistants would interview them. It seems I have a lot to learn still about doing research in southeast Asia. So I’m in this international research project VECTORS, dealing with many exciting and fascinating issues, working with scientists from all over Europe. But if I tell you I was at a VECTORS workshop in Edinburgh last week, it’s not exactly like we were sipping 40 year old Talisker in Edinburgh Castle with Queen Elisabeth. A business hotel near the airport is more like it: easier to reach, lots of meeting rooms, good food, and no distractions. 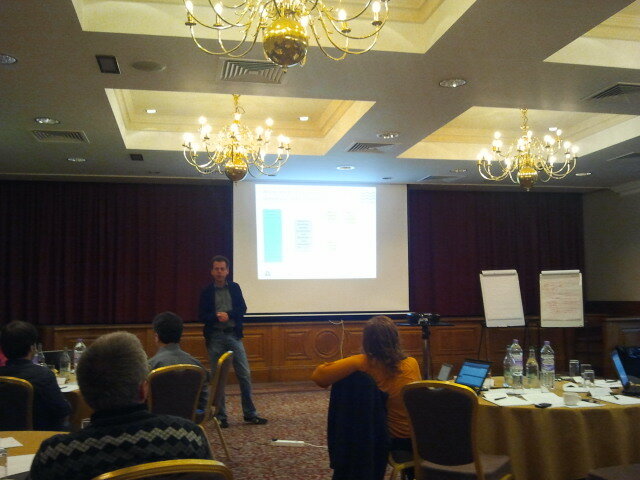 Scenarios were the main theme this time. A lot of the developments that VECTORS deals with are highly uncertain. How warm (or cold) will our waters be in the coming 50 years? How many sunbathers will visit Mediterranean beaches? How many international transport vessels will visit the ports of Rotterdam and Antwerp? Even if you knew the probabilities they would not be independent. A high nutrient load is more likely if there are many people around spending their money on lots of meat or highly fertilised crops than if the population is small and poor. The number of possible combinations grows exponentially with the number of variables. Suppose you want to consider three levels of each variable. Then one variable gives you three possible outcomes; two variables have nine possible outcomes; three variables have 27 possible outcomes; 10 variables have 59,049 possible outcomes. And then the ecologists in your team tell you that running one such outcome on their model takes one month. So if you have 5000 years you can do a sensitivity analysis of all 10 variables! There are many other possible developments that are difficult to capture in numbers, such as changes in regulations, customs, technologies, and so on. Policy makers have neither the time nor the energy to read your entire sensitivity analysis. They want something you can summarise in one page (which they skim rather than read). So what do we do? We develop scenarios. But what are scenarios? A scenario is not a prediction of the future. It is more like a story line that describes how the world might develop in the future, taking into account different possible trends. It should be consistent, and ideally you have a set of scenarios that spans a fairly wide range of possible developments. A scenario is not a policy option. When you see the different scenarios from, say, the IPCC, you may be tempted to say: “let’s go for this one.” But although you may certainly like some outlooks more than others, the idea is that you don’t know which one will come true – and you have no influence on which one comes true. At least, scenarios can help us to make sense of the complexity of the different social, economic, political, and biophysical changes that may take place in the future. A few consistent story lines are easier to understand than countless histograms and plots, for scientists as well as policy makers. And they still allow us to explore how different policy choices may work out in the future. At some point I joked that we should have Philip Pullman write our scenarios, but I was only half joking. It’s at least as much an art as it is a science.